Courtesy of your intrepid Committee Secretary, who, at great personal expense, has personally tested all of these hostelries, ably supportedby pint sized Paul, here is the list of “preferred” London Wolves pubs. 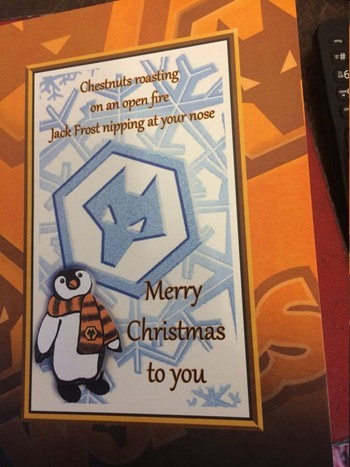 A Burton pub has received some early festive cheer after supporters from one of Burton Albion's rivals sent them a Christmas card – and a whopping tip for staff. The Burton Bridge Inn, located on Bridge Street, played host to members of Wolverhampton Wanderers London Supporters' Club when the team played against Burton Albion in the Championship on Saturday, September 30. Wolves beat the Brewers 4-0 on the day and members of the club celebrated at the Burton Bridge Inn after the match and have remembered the hospitality they received that day. 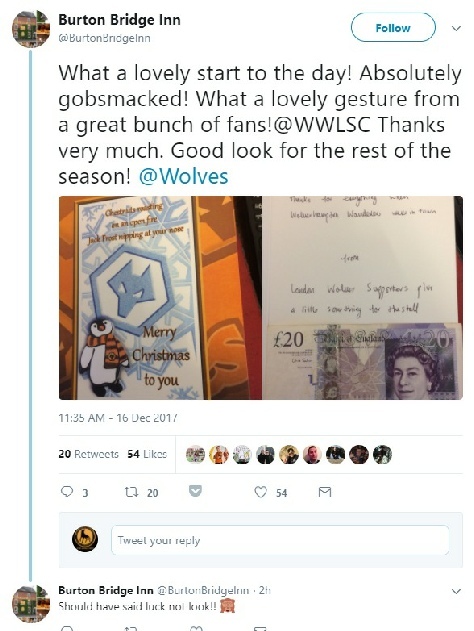 Almost three months later, the Burton pub clearly made quite the impression on the supporters, who decided to send a festive card and a £20 to spend on a Christmas treat for staff. The card reads: "Merry Christmas and a happy new year. Thanks for everything when Wolverhampton Wanderers were in town. From London Wolves Supporters, plus a little something for the staff." Carl Stout, who has been the landlord of the Burton Bridge Inn for nine years, explained that he was shocked when he heard that the card had come through. Mr Stout said: "I got a call from my wife on Saturday when I was at home, she said about a Christmas card coming through the post at the pub from the Wolves supporters club. "They came in at the end of September, when Wolves were playing Burton, and the card just really thanked us for everything. "I was absolutely gobsmacked to be honest with you, I didn't expect a Christmas card, especially with the money they put inside as well, saying to treat the staff. "It is a fantastic gesture, I don't know if it’s something they do as standard, and for other pubs, but either way we really appreciate it. "Wolves fans always travel in great numbers. Some of our beers, particularly Stairway to Heaven, they serve in Wolverhampton and they love it so I think they made a beeline to the Burton Bridge. "One of our regulars is actually a Wolves fan, so he always has friends come down in a coach to see the match. "These guys from London, we knew they were in the pub, they obviously enjoyed the experience and the pub. We usually have supporters return after being here once the following season, we usually share a bit of banter, you know 'might not see you next year', but definitely nothing like this before." The card has been displayed at the pub on the notice board, and Mr Stout explained that it has been a talking point among staff and customers about the generosity of the supporters club. 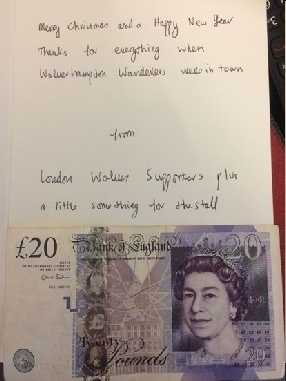 David Slape, the secretary of Wolverhampton Wanderers London Supporters' Club said they decided to send the card and the gift after receiving excellent hospitality when they visited after their side's victory. Mr Slape said: "We found it welcoming and the staff superb. The beers and pies are great, in fact everything about the pub is great, not to mention the Burton fans. "Well done and I look forward to calling in again."